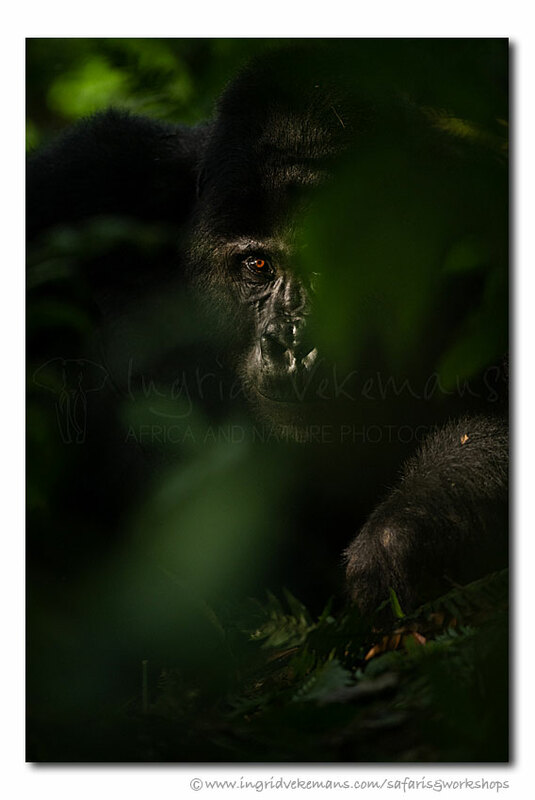 Back home from a beautiful photo safari through Uganda, with lots of opportunities to photograph shoebill storks, chimpanzees, gorillas, leopards, birds etc. What we were all in great anticipation about, though, materialised in the end… two fantastic gorilla trekkings in which we became part of a family of sweet, friendly giants for a little while. An unforgettable experience. Very moody and mysterious, Ingrid. I love the elusive single eye peeking out of the darkness - much more effective than a conventional portrait. All of your prior submissions have been out standing, but I think this is your best, yet. Looking forward to more. Only other comment: if going to be printed (which I assume it will be-it should!) perhaps remove the bit of leaf on the arm and tone down the light green in upper left corner??? This is really special. Thanks for posting it. A stunning capture! Love the intensity of eye. Just wondering, as I’m still finding my way on the ‘new’ site - is there a page where all my photos are visible? I can’t seem to find it. Ingrid, I’m not sure if there is actually a “page” where our own images reside. However, what I have done each time I’ve posted an image is to “bookmark” each one. That way I can go to my icon and open the bookmark symbol and see what I’ve posted as not to duplicate things. Just an idea unless others have found another way. Thanks for the tip, Paul, shame there’s no page where a photographer’s images can reside so anyone can have an overview. I will do the bookmarking as well for now. Thanks again, Ingrid. One of those captures that talked for themselves. Those plants cover him exactly as needed to give the shot more power. Awesome job. One brief comment that needs no explanation. National Geographic. Indeed a special image that speaks volumes. I can only imagine the experience. Absolutely amazing. I can’t even imagine how life changing that experience would be. This is just fabulous. It is mysterious and evocative. I am in awe. Lovely, Ingrid. The deep, rich colors are outstanding. It’s not always easy to get those orange eyes to stand out, but you nailed it.